The plan for this morning was for us to meet at Collin and Jessica’s studio at 9.30, load our gear into Alco’s van (Alco is our front of house sound engineer) and then set off for Germany. However, it was decided (very sensibly, if you ask me) that it didn’t take the entire band and crew to load a van… as a result of this wise decision I set my alarm for 9.30 and had a late breakfast with Jessica! 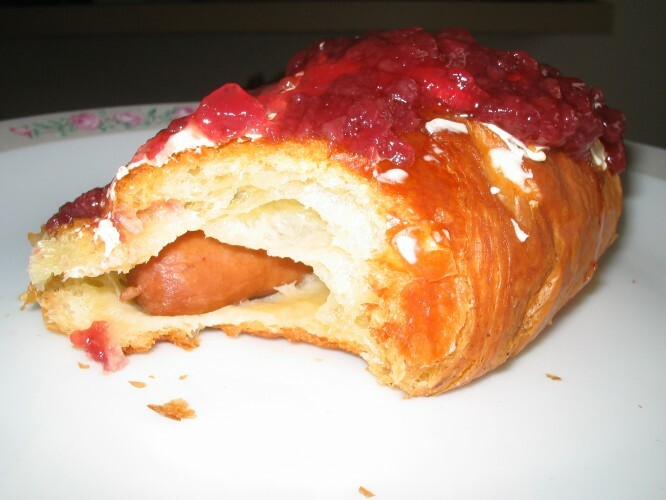 We decided to have croissants for breakfast, so Jessica found 2 croissants in the freezer, defrosted and grilled them. 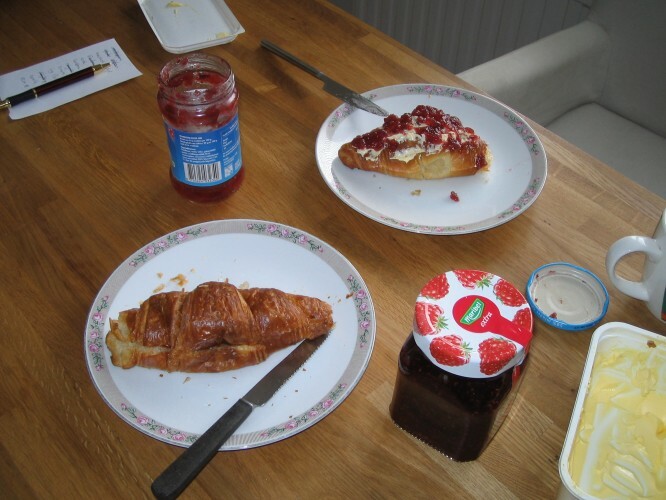 We sat down for our breakfast – Jessica covered the top of her croissant with butter and jam, whilst I cut mine open to put the jam inside. 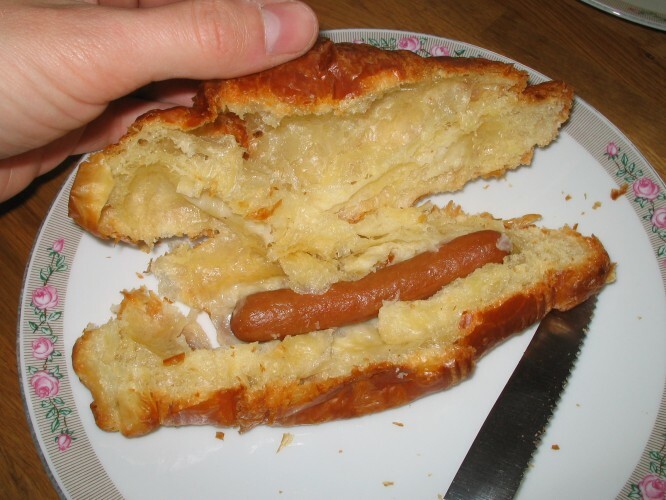 When I cut into it I was astonished to find a… sausage!!!?! As I was cutting into it, Jessica was taking her first bite and found the same! We decided to leave the croissants and I opted for some fruit instead! At around 10.30 the band and crew arrived at Collin and Jessica’s house, had some tea and coffee, Collin ate my sausage croissant (brave man) and then we set off about 45 minutes later. 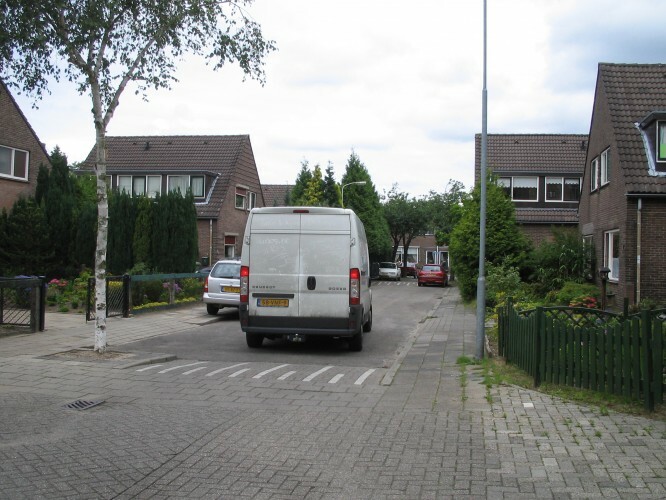 Outside I saw our van for the trip to Germany – a 9-seater minibus with the word ‘Noot’ written in big letters and the phrase ‘Voor het hele koor’. 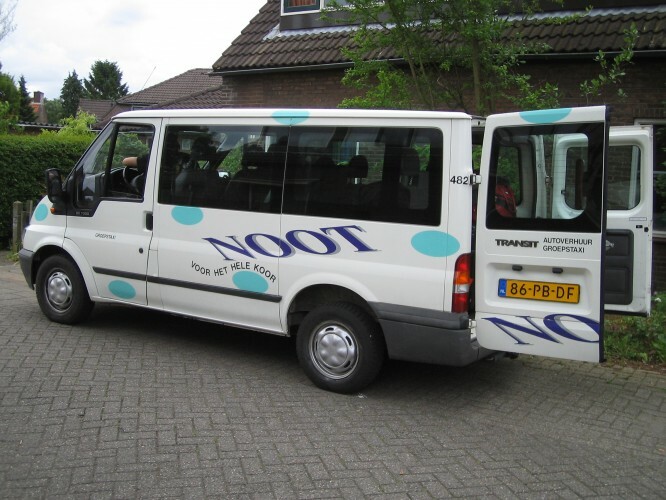 I knew from a previous trip to the Netherlands, when I’d played a club called ‘De Noot’ with Carl Palmer, that ‘noot’ means a musical note. I had to have the other phrase on the side of the minibus translated for me; ‘For the whole choir’… how apt! 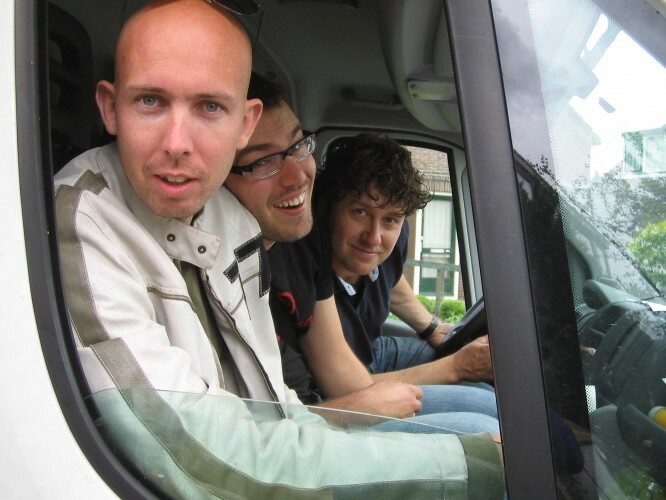 There were 6 of us travelling in the ‘Noot’ bus; Collin, Jessica, Mattias, Ruben, Max and myself, whilst Alco, Henk and Wilco set off in the van with all our equipment. 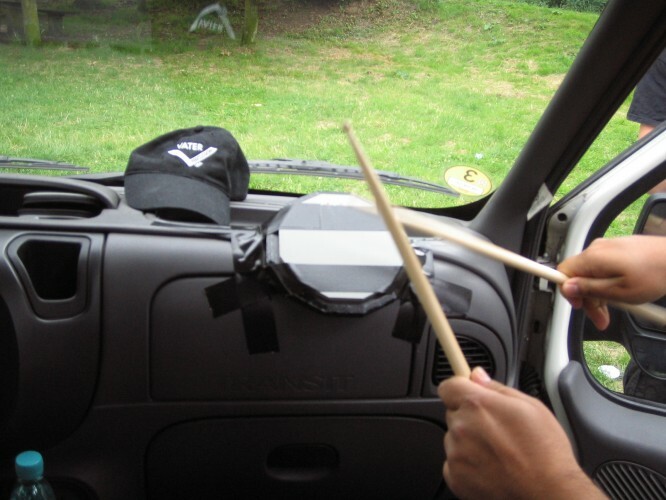 Our journey was pretty uneventfully; we listened to music on Collin’s i-pod, I started this tour blog and played a little guitar, and Collin set-up a practise pad on the dashboard of the van. We arrived at our hotel just outside of Munich, about 8 hours after we’d started our journey. After unsuccessfully trying to convince the hotel receptionist that my room should have a Jacuzzi in it, we went upstairs to drop our bags in our rooms. 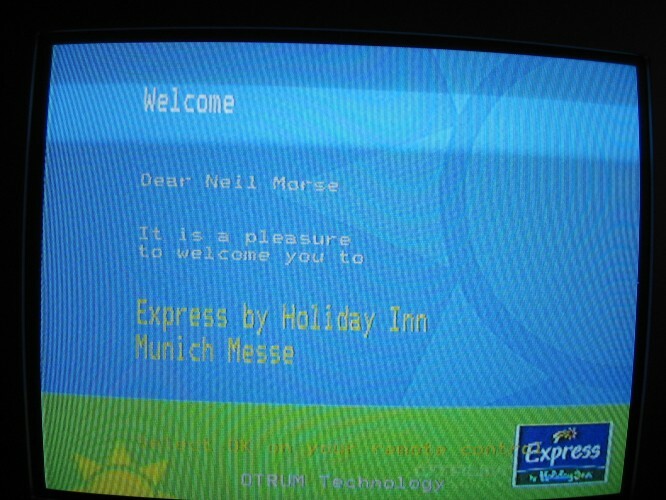 When me and Ruben got into our room we found that our TV was welcoming a third guest… Neil Morse! We weren’t sure whether this Neil was actually our Neal or, more importantly, where he was planning to sleep in our 2 bed room! After dumping our bags we went back down to the hotel lobby and headed out in search of wiener schnitzel… it wasn’t long before we’d found a very promising looking small German restaurant / bar. When we walked into the bar it was like a scene from an old western movie; the chef, the waitress, the manager, the other customers… everybody in the room was completely silent… they watched us intently as our loud English chatter turned into an apologetic, “Have you got a table for 6, please?” After an awkward pause that seemed to last for minutes (but in reality probably only lasted a few seconds) we were shown to a large table in the corner of the room. 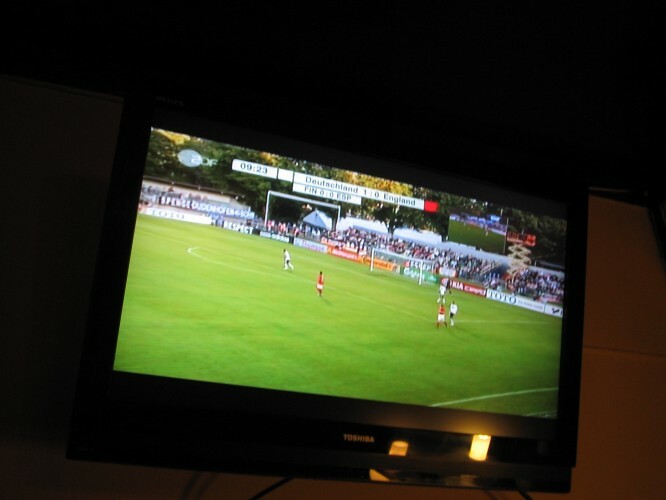 We sat down, saw that they had wiener schnitzel and also saw why we’d been given such a frosty (un)welcome… a large flat screen TV mounted on the wall was showing a football match… Germany versus England! Thankfully, after our initial rocky start, the waitress seemed to warm to us and later in the evening she even gave us some extra fried potatoes (it was the closest they had to French fries), free of charge. After the meal we went back to our hotel and I ran the set whilst Ruben, my room mate, had several battles against several countries on his laptop (I think the game was called ‘Red Alert’).